Baalbek (Agenzia Fides) - The cave monastery of Saint Marone, a place dear to the historical and spiritual memory of the Maronite Christians, re-opens to liturgical celebrations, devotional practices and pilgrimages, after centuries of neglect. On Tuesday, August 31, the day of the "Saint Marone student festival", a Eucharistic liturgy was held at the cave-monastery, presided over by Hanna Rahmé OLM, the Maronite Bishop of Baalbek-Deir el Ahmar. Some politicians and representatives of the Lebanese Maronite Order also took part in the Mass. Located in the north-east of Lebanon, not far from the border with Syria and the sources of the Oronte river, the cave monastery is part of the treasure of memories and places related to the Christian adventure of Saint Marone, who lived between the 4th and 5th centuries and considered the father of the monastic-spiritual congregation that gave rise to the formation of the Maronite Church. Already in the fifth century those same caves were occupied by the first students of Saint Marone. The re-opening of the place to liturgy and devotion is lived by many Christians with gratitude. The news of a place so dear to Christian memory is a joy. "We managed to get this convent back - said Bishop Hanna during the homily - and now we want to share it as a sacred place, with our Christian and Muslim brothers. Perhaps, the first Maronite Patriarch was elected here. And whoever comes here feels the presence of God". 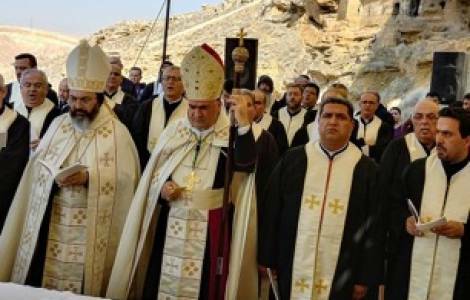 The Bishop of Baalbek - local sources told Fides - has also announced that soon at least one mass will be celebrated in the cave monastery every day.